Artist Ray Crook and writer George Johnston were neighbours in the Sydney suburb of Mosman. 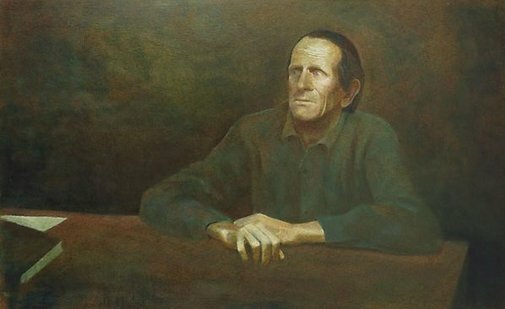 The Archibald 1969 win came as something of a surprise to the art community as Crooke was known primarily as a landscape painter. Peter Ross, 'Let's Face It: The history of the Archibald Prize' 2005, pg. 144. This work was acquired by the Gallery in 1970. Signed and dated l.r., red/brown oil "R Crooke/ 69". James Gleeson; 'Big Prize to Sydney artist'., The Sun , 'Few bright spots in Prize showing', Sydney, 14 Jan 1970, page number unknown. Anna Waldmann, Art and Australia (Vol. 20, No. 2) , 'The Archibald Prize', pg. 213-236, Sydney, Summer 1982, 232 (colour illus.). Elizabeth Young., The advertiser , 'Painting, sculpture', Adelaide, 24 Jan 1970, page number unknown (illus.). Art Gallery of New South Wales, Archibald, Wynne & Sulman Prizes for 1969 , Sydney, 1969. Let's face it: the history of the Archibald Prize , 'Chapter 4: Into the 1970s', pg. 61-85, Sydney, 2005, 61 (colour illus. ),144 (colour illus.). Let's face it: the history of the Archibald Prize , 'Into the 1970s', pg. 63-87, Sydney, 1999, 63 (colour illus. ), 134 (colour illus.). The Archibald Prize: an illustrated history 1921-1981 , Sydney, 1981, 232 (colour illus. ).